For some of us, motorcycles are a weekend toy which we drag out of the garage on a warm day, opting to take the car whenever the weather takes a turn for the worst. Sometimes you’ve just been away on holiday a little too long, but whatever the reason, leaving your bike un ridden for any more than a few weeks is almost guaranteed to result in a flat battery. Which brings us onto the battery trickle charger. These go by many names such as battery conditioner, optimizer and tender but they all generally do the same thing. Hook one of these up to your bike’s battery and it will provide a steady flow of current, keeping the battery topped up and ready for use. The other benefit of a motorcycle trickle charger is that repeated extended periods of time with a depleted battery means that its lifespan is heavily shortened. Sooner or later you’re going to have to replace it and they aren’t cheap. All of the units on test are also capable of charging batteries from flat. If that isn’t enough justification, these trickle chargers can also be used on your car so there really is no reason not to have one. We have reviewed some of the best available and ranked them in terms of ease of use, functionality and overall value for money to assist you in finding the best battery tender for your motorcycle or car. Welcome to our best motorcycle & car battery chargers round up and review. The G3500 is your do it all home battery charger and tender. 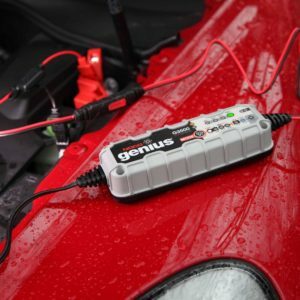 It secures the top spot by being one of the few products on the market able to charge both 6v and 12v batteries as well as offering compatibility with standard lead-acid batteries (including AGM) in addition to the newer lithium-ion type. We know a lot of people out there are now running lightweight lithium batteries in their bikes so this should be your first choice. The fact it also supports lead-acid batteries still used in a lot of cars and trucks is a huge bonus. Charging amperage is a respectable 3.5A and the G3500 is able to charge and maintain batteries up to 120 amp-hours in size. This model is also able to charge a dead battery from flat in case you find yourself caught short. 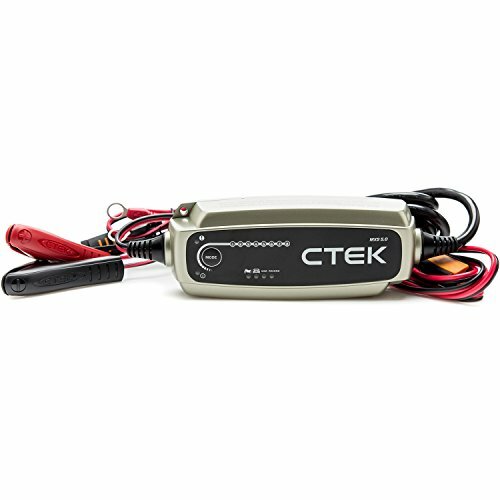 Power is provided via mains with the option to charge from a vehicles 12v socket or OBD ll port. CANbus technology means that some newer vehicles don’t even need to have the ignition switched on for 12v socket charging to work. 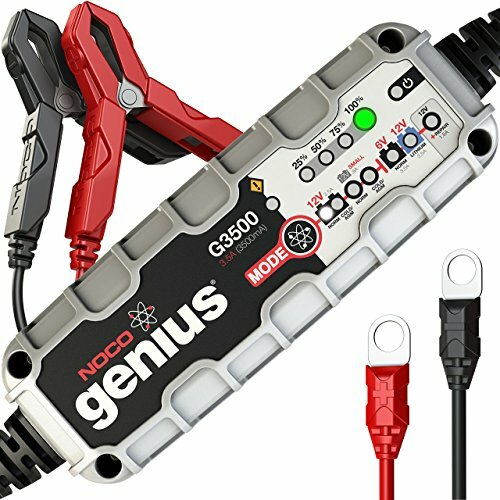 The Genius G3500 basically incorporates 5 different products into 1 so if you need a charger for the home or workshop, this should be it. The MXS 5.0 is our runner up from CTEK. It misses the top spot due to omitting 6v (used by older vehicles) and lithium-ion charging capability but if you don’t need either of those features then this model is well worth a look as a great motorcycle battery tender. The MXS 5.0 is just about the fastest portable battery charger there is, supplying a continuous charge rate of 5.0A and providing enough juice to maintain a 160 amp-hour battery. Temperature compensation is present which allows use in ambient temperatures anywhere between -20 and +50 degrees Celsius. Our favourite features are the automatic 8 step charging system that is designed to prolong battery life as well as the fact that it is waterproof in case you’re caught in the rain. Finally, this model is able to diagnose battery conditions and tell you whether your battery is still able to hold a charge. We didn’t like the fact that the included leads are relatively short so you might find yourself buying a few accessories depending on your needs. The MUS 4.3 is the North American market equivalent of the MXS 5.0 It provides the same great features that are listed above with a slightly lower output rating of 4.3A, so pick this model up if you’re Stateside. 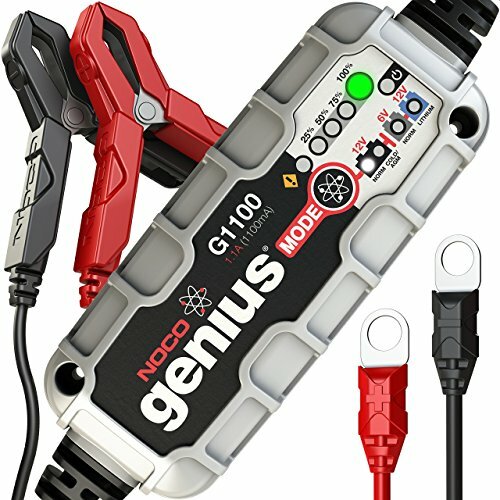 Back over to NOCO and we have their Genius G1100 model. It’s a lacking a few features compared to its bigger and more expensive brother but still makes a respectable battery charger for the home. 6v, 12v, lead-acid and lithium-ion support is present once again. The difference here is in the charging rate which is a slower 1.1A, meaning it will take 8 hours to charge your average 18 amp-hour motorcycle battery. The G1100 is also only able to fully charge up to a maximum of 40 amp-hours although can still maintain a battery of any size. The same great battery repair function you find on the larger model is present as well as the option to fully charge a smaller battery from flat. We would not hesitate to recommend the G1100 if you’re happy with its charging speeds as it represents great value for money. 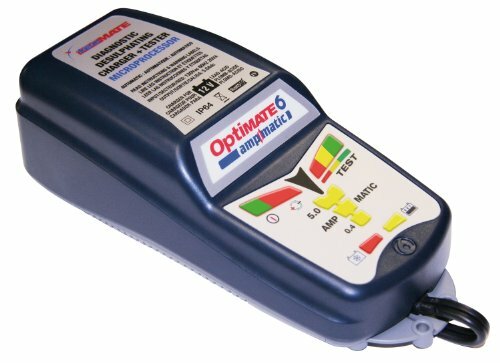 OptiMate has always been a big name in battery technology so we’ve included their ‘6’ model in this review for all those who have a collection of OptiMate leads laying around. From a feature vs value for money point of view, the OptiMate 6 comes in at last place. 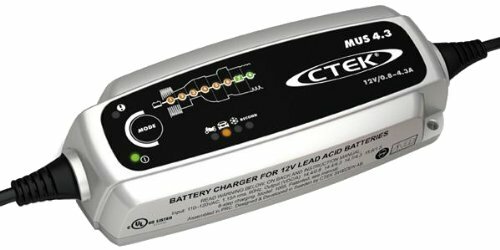 It is only able to charge a 12v lead-acid battery which does limit its usefulness but still offers a fast 5.0A charge rate all the way up to a huge 240 amp-hours. The magic lies in its charge verification, retention and maintenance software which assesses your batteries condition periodically and alters its charging parameters to suit. This is going to provide your battery with the best lifespan possible. If your battery is on its way out, it will also tell you when it’s time to buy a new one. The OptiMate 6 has great build quality and we’ve known these things last for years with regular use so if you’re a fan of their products and already own a few accessories, this one may be for you. Since these devices are so portable, it is perfectly reasonable to carry one with you, just in case. An appropriately sized motorcycle backpack is the pefect way to achieve this so head on over to our guide to purchase the best one. We know which one our favourite is but you really can’t go wrong with any of the above. They will all repair, charge and maintain your batteries so the choice comes down to your individual needs and what you are looking for in the best motorcycle battery charger. We hope this review was useful, please feel to send us a message with your experiences.